It's that time of year. You know that one. It's the one with W-2s, 1099s, and a gift basket full of "please help me get a nice refund!" to your tax accountant. And if you just got married last year, then welcome to the world of trying to figure out filing your taxes together for the first time! With the deadline of April 15th just around the corner, we are so excited to have local tax expert and accountant, Ryan Gerres of Gerres Accounting Online to share some very helpful and key tax tips for today's Tuesday Tidbits to help you prep! No matter when you tied the knot last year, if you were legally married by December 31st at 11:59pm then according to the IRS, you were married all year! And you can reap the tax benefits that come with your new married status! The big question – should you file jointly or separately with your new spouse? The marriage tax penalty that you might have heard of is mostly a myth and only affects a small percentage of taxpayers. Generally, filing jointly is the way to go for most couples because of the massive benefits for a household. If that wasn't enough to scare you off, generally, your tax rate will also be higher if you file separately! Check your paperwork. Hiring a professional will not only give you a peace of mind, but they will always have the most up-to-date information on tax laws and know what changes the IRS has made in the past year. 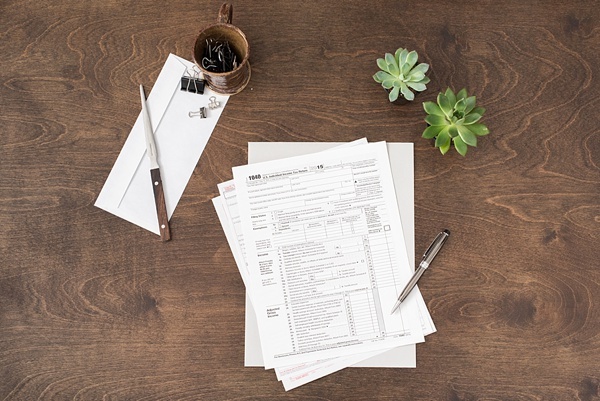 Keep all your paperwork, forms, financial information, pay stubs, or anything that relates to income or deductions to give to your accountant. Even if you don't think it's necessary, keep it anyway! You never know if there is a deduction or not. Check your withholding. You may want to check the amount that your employers are withholding for the two of you with an updated Form W-4. The IRS has a withholding calculator you can use if you wanted to fine tune your withholding. If you prefer to have the highest amount withheld during the year, you will probably want to check the ‘Married, but withhold at higher Single rate’ option on the new Form W-4. Photography by Caitlin Gerres Photography. To get more tax information and/or if you're a business owner, consider subscribing to Gerres Accounting Online's biweekly accounting and tax tips newsletter that will help your business stay organized. You'll never have to stress about tax season again!